250 g dark chocolate chip or bar. Mix butter and sugars. Whisk in eggs, vanilla. Mix bicarb soda, salt, and flour. Mix flour into dough. Mix chips/chunks of bar into batter by hand. 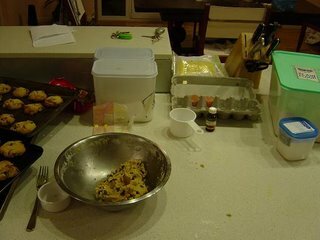 Spoon or place cookies on ungreased baking sheet. Bake at 180 C for 10 minutes, or until slightly browned. This is the simplified metric version of my family recipe. It has been field tested on four continents, in two different languages. A metric cup is 250ml. A metric teaspoon is 5 ml. This recipe assumes light or golden brown sugar. Brown/white sugar ratio can be adjusted to suit local brown sugar strength. Brown sugar can be synthesized from molasses/golden syrup and white sugar, if no local supplier is available. The salt content of butter varies from place to place, so the amount of salt to be added should be adjusted to taste. Duck eggs have been used instead of chicken eggs, but they do not result in any significant improvement. The egg is not an SI unit, but a naturally quantized fundamental particle. It cannot be fissioned without creating a mess. Some people prefer a broken up bar of dark chocolate over chips. If baking in an oven with an exposed bottom heating element, place an unused baking tray on a lower rack to prevent radiant heating of the baking tray, which can burn the bottom of the cookies. These cookies have been successfully cooked in the temperature range 150-190C, although cooking times obviously vary. Care is advised if cooking on a wood fired oven, or any oven with large temperature gradients. Mmmmmmmm. Good thing I placed an order for brown sugar from my friend who just took a trip to the US. Julie, what about if i come visit you? or you can just make some and send them to me. Hi Lab Lemming, im a friend of Julie, she tells me you are in Canberra. Do you know people from the physics department there? I know Annabel Alexander from the Manson group. I know Jul and her hubby from college. Although I do know some physicists socially (don't laugh), I don't know either of those people. Are you Frau Erbium? If so, you might want to make the acquaintance of Carl Spandler, an Australian post-doc recently arrived at Bern. Controlled egg fission can be achieved with a modest amount of practice and a simple two-part containment structure (eggshell + bowl), enabling atomic age desserts such as lemon meringe pie. Yes, but the fission products of an egg have different chemical, physical, and gustational characteristics than the original egg. Egg fission does not produce two identical half-eggs; it produces an egg and a yolk. Furthermore, the number of equines and feudal primates required to synthesise an egg from yolk, white, and shell approaches a Nursery Asymtote. Egg fission my require its own topic to fully explore- but not until this poster is done. I'm fond of chocolate and choco-recipes! For chocolovers I have some facts about chocolate! Nice recipe - thanks! I found it a little sweet on the first attempt and so cut the white sugar a bit. They are also nice with about 200g of Maraschino cherries chopped into quarters and kneaded in after the chocolate (gently, otherwise they'll shred).